The memories of Mumbai’s Black Wednesday will haunt us in the years ahead. Pictures of terrorists armed to the teeth striking with precision across the metropolis at carefully selected targets overlooking Gateway of India to cause maximum impact on the national psyche will be etched in India’s bloody history of terrorism. The sad saga of the death of at least a score brave policemen and 100 citizens, both Indian and foreign, should move our hearts and minds and fill them, not with fear as the terror groups would want, but with a national resolve. The time has come for us to take the issue of terrorism with far greater degree of seriousness than ever before. Kautilya, the statesman sage, warned us millennia ago of the four dangers to the state, of which “those of internal origin and external abetment and internal origin and internal abetment" remain our principal challenge. Terrorist acts notwithstanding, the popular notion cultivated by effete political leadership and the police is curable. Using the theory of power laws, the frequency of incidents of terror in the country today is one major incident per month. The chronology going back from Mumbai on 26 November to Guwahati in October, Delhi in September, Bangalore, Ahmedabad and Surat in July and Jaipur in May proves the point. The expertise of terrorist groups seems to be increasing after each attack. 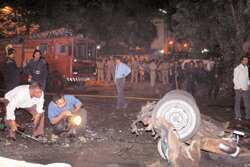 Mumbai falls in the class of a military commando operation against soft targets. Guwahati serial attacks needed precision and training. Thus the sophistication of terror attacks is increasing day by day. Locating the next target is also not very difficult. The Indian Mujahideen had very clearly indicated as early as in July that the next strike would be in Mumbai. Obviously the state and Central governments failed to take this threat seriously and build the capacity of the police force to face this challenge. In the interim period, the social capital in Mumbai after the insider-outsider controversy had greatly weakened. These were the makings of a soft target the perpetrators of terror were waiting for. The challenge is not insurmountable. Building political consensus on terrorism is the first requirement. Polarization for votes is a natural process of electoral democracy. But there are red lines that political leaders need to draw and combating acts of terror or violent intimidation, irrespective of religion, caste or creed, is one frontier that cannot be breached. Intelligence, or the lack of it, is an issue which has been discussed many times over. There is an impression, supported by even high-ranking police officers in the country, that countering terrorism is a grass roots problem. While beat policing is important, unless terrorist groups are penetrated, gaining intelligence about impending operations is impossible. Given that some of these groups are based outside the country, if this has to be a cloak-and-dagger operation, so be it. The inability of agencies to penetrate groups within the country remains inexcusable. Premier intelligence agencies have been accused of focusing on collecting political rather than terror or criminal intelligence. The capacity of these agencies has to be built up through recruitment, adaptation and training. Britain exponentially enhanced counterterror intelligence capability of the MI5 after the London bombings through open recruiting a model which the Intelligence Bureau could well follow. Operationalizing intelligence is another part of the same problem. Misled by the police brass, some top political leaders in the country have stated that terror warnings are like weather bulletins. The inability of the local police to convert terror advisory into preventive actions on the ground is a gaping hole in our policing abilities which needs to be set right. Furthermore, contribution and cooperation of citizens can be obtained by the simple tool of colour-based advisories—red, amber, yellow and so on—which are common in the West. There are large gaps in arming and equipping the police, their response to emergency situations and incident management. The present notion of modernization is one of buying vehicles, communication equipment or at the most smart weapons for the elite. The response of our bravest officers who sacrificed their lives as they went into encounters unprepared bears testimony to what needs to be done in the days ahead. Given that the attacks in Mumbai came from the sea, the three-tiered coastal security scheme, which was to be in place on priority on the Maharashtra or Gujarat coast, remains unimplemented. This scheme envisaged surveillance of the coast by newly raised coastal police, by the Coast Guard and on the high seas by the Indian Navy. The ministry of home affairs (MHA) status report dated 1 September claims that 55 of the 73 police stations are operational, 22 of these—as per the MHA annual report—in Maharashtra and Gujarat. A joint patrolling scheme, Operation Swan, has been put into place for these two states starting 2005-06. The ease with which terrorists have been able to enter India’s commercial capital indicates the lackadaisical approach with which this scheme has been implemented. The role of the media is no less important. Uninformed and speculative reporting, reruns of file footage without giving the date and time are the bane of 24/7 news channels. This greatly undermines their role in informing the public. Above all, to tackle terror we need real leadership, not letters from a prime minister to a chief minister. Hundreds of citizens who have lost their lives in the recent past deserve political, police and administrative leaders who are responsible and accountable for their commissions and omissions and who do not treat every incident as another opportunity to shed crocodile tears.